I recently attended my first, second, and third tech conferences as a scholar. Here’s what I learned, what I wish I would have known, and a jump-start to help get the most out of your first or next tech conference. Maybe it’s just me, but HBO’s Silicon Valley a̶n̶d̶ ̶t̶h̶e̶ ̶c̶r̶o̶o̶k̶e̶d̶ ̶m̶e̶d̶i̶a̶ ̶l̶o̶l̶⠀nearly had me convinced that programmers are socially inept and code to avoid professions that require talking to other people. If I’ve learned anything this year it’s that working with others to build, explaining code you wrote and why takes serious communication skills. The side of me with a background in Communications was relieved to have a transferable skill set. I laughed during these conferences. A LOT. From presenters to casual chats, I’m almost embarrassed to admit I ever thought anything different. Attending your first tech conference can be so exciting, you blink and suddenly it’s over. Write down tangible goals ahead of time, e.g. meet a speaker, connect with someone from another country, try something new. Reviewing the speaker lineup ahead of time can help rev up excitement and reduce a sometimes paralyzing feeling of too much choice on site. Map out a game plan, but allow room for refactoring and spontaneity. Booking accommodation on time can result in a reduced hotel conference rate. Finding a roommate who’s attending the same conference cut costs further. Luckily, I clicked with mine! We connected before the conference, saw the city together, and still lead separate enough experiences throughout the week to explore different interests and swap stories later on. Plus, it turns out, she’s currently completing the very dev program I aim to attend. Meeting someone face-to-face and gaining first-hand insight was unbeatable. Use event hashtags and engage while ideas are still fresh. 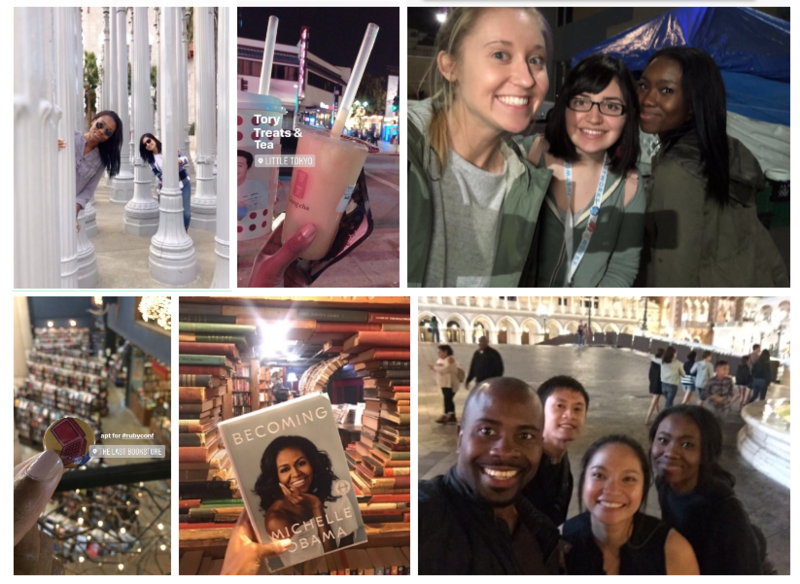 As silly as it may sound, a hashtag has lead me to scholarships, freebies, and meetups. Several attendees mentioned recognizing me from the event’s hashtags before I could formally introduce myself. Tweet away! You’ll typically have the chance to visit vendors to level up your sticker game, grab snacks, and win prizes. More importantly, these perks are an exciting chance to network and learn about teams you could see yourself working with. If the thought of introducing yourself to a potential dream employer gives you the sweats, consider warming up by chatting with a few other organizations beforehand. Ask thoughtful questions and, if you connect, secure a business card before moving on. If you’re trying to travel light, leave the nightshirts at home. You’ll likely pick up a few (or seven) ultra-soft t-shirts to get by. 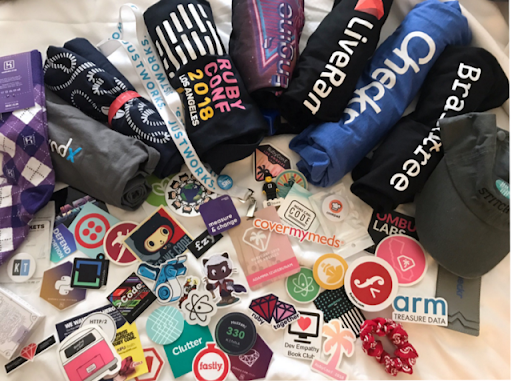 It wasn’t until the final day at RubyConf, when it was explicitly highlighted in a keynote, that I learned color-coded stickers on attendees’ badges signal to others that an attendee does not want to be photographed (h/t @saronyitbarek). A leader in tech felt unsafe attending events for months aware that her abuser could find her if her photo was taken and shared. I knew that intimate partner violence was not uncommon, but held a blind spot in the simple way that staff and attendees can protect one another. Offering attendees a way to share their pronouns is another simple step toward fostering a more safe and inclusive environment for trans and non-binary folks. R-E-S-P-E-C-T! Gender pronouns on my RubyConf and PyCon US badges. Unless you’re working remotely or truly prefer to take notes via laptop, feel comfortable leaving it behind. Try a pocket-sized notebook instead. If you’re looking to do the absolute most (me always) hit record on your smartphone’s voice memo app at the beginning of a few talks you’re most looking forward to. Mark the recording time whenever a speaker presents an idea you want to revisit (Ex: 18:07 — ML 2014 case study). I could easily note points of confusion, correctly cite lengthier quotes, and reference a string of resources not listed on slides. This helped curb the idea that maybeI’d remember to search through an entire talk for a few words once it’s eventually posted online. Pics or it didn’t happen. 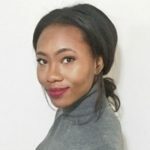 I had conversations with Creator of Ruby ‘Matz’ , Founder of Code Newbie Saron Yitbarek, and former Github Social Impact Lead Bianca Escalante who spoke on D&I and the industry’s tendency to focus on inconvenient issues rather than societal ones. WILD. There’s a wide discrepancy in all forms of diversity between developers and their consumers, so for me it was an exciting start to meet doers who have paved the way in their own rights. Assess the situation and shoot your shot with an introduction! Your conference might also include a board with index cards and corresponding time-slots. This is available for attendees to curate topics to later discuss with other programmers who they might not ordinarily have the chance to meet. I’ve found these discussions go by several names depending on the community. RubyConf calls these hallway talks “Birds of a Feather”, while PyCon reserves rooms for what they refer to as “Open Spaces”. I’ve seen spaces for niche technical discussions and health tech, to something as relaxed as a space to unwind with chocolate. Don’t see a topic you’re interested in? You, yourself, have the power to write-in any *appropriate* topic and create space for open discussion. 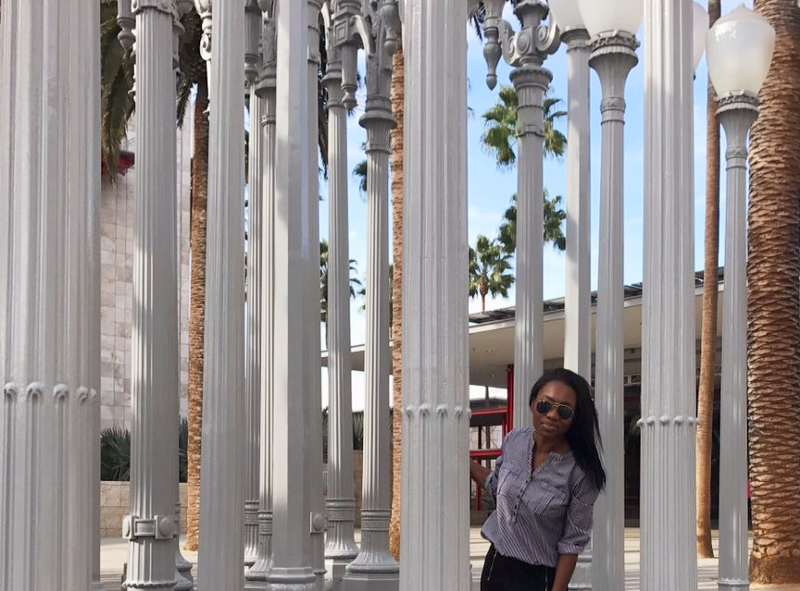 Initially I was nervous to attend a space where I could brainstorm with experts. Now, I only wish I’d found these spaces sooner. If you have no interest in meeting a speaker or participating during a Q&A session, catch the talk later online and challenge yourself to attend an open discussion with people who are wildly curious about the same things as you. This is a nice way to shift gears when you’re maxed out on talks for the day and want something more interactive. Be on the lookout. Through a spread of speaker schedules and other signage vying for your attention, this can be easy to miss. Lightning talks are common within the programming community where attendees can share a quick, 5-minute presentation on any approved topic. Sometimes this provides neat insight on what piqued one’s interest in tech. One example includes Tory who analogized her love of crocheting with her experience as a developer. Be prepared to pitch or sign-up quickly, though. They’re highly sought after! One scholar told me they were too nervous to give a talk. The idea of introducing themselves to another person was nerve-racking enough. Before the room filled, her mentor brought her to a podium on stage and had her introduce herself to a sea of 700 empty seats. It was a real first step. He let her know that if she ever did decide to give a brief presentation, she would hold the opportunity to introduce herself to an entire community at once and that afterwards they would be the ones introducing themselves to her. You rock for this one, John (@johnksawers). Some lightning talks are off the cuff, others are prepared well in advance. Produce a talk, iterate, and reach out to someone to make it that much stronger. What better way to introduce yourself to the community? This is the single something I wish I’d taken into serious consideration. Is this a hashtag yet? 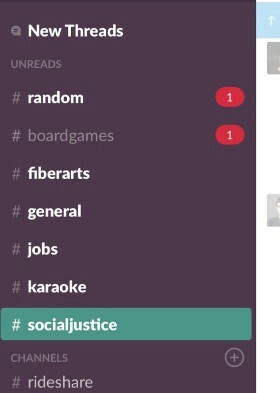 Some tech conferences use Slack − an app where users are invited to join channels for discussion and collaboration. For the purpose of conferences, attendees can ask questions, create meetups, and continue dialogue beyond any single event. This was especially helpful for me to maximize my downtime and even save money through coordinated ride-shares to and from airports. Hands down, I would not have met some of the folks I connected with most without event staff including this outlet for attendees. If you feel safe and you have the means to do so, find time to leave the building and stroll around the area. Larger conference venues are often connected to hotels, which is convenient, but makes it easy to wonder how you’re packing to leave at the end of a trip and still know nothing more about the area than when you first arrived. RubyConf has an amazing built-in support system for scholars which made it possible to bond with my cohort and walk to the The Last Bookstore. After a full day it can be tempting to close up shop. Challenge yourself to attend a conference-sponsored event. I decided that as long as I felt safe, the answer would always be “yes” to attending — even if only for a few minutes. On Day 1 of React Conf I did a quick sweep of the reception and disappeared up to my room after one, maybe two minutes. I was nervous and convinced myself I was “just tired” until I got a message from an attendee I’d shared a ride with earlier that day asking where I was. See, #slacksaveslives. By Day 3, I’d kicked the shy bug. I’d found a friend to paddle board with on-site during a 50-minute break and connected with another buddy for 6 am yoga earlier that morning. Free and free. Organic conversations from those outings opened stories on non-traditional paths toward tech, unfolded discussions on mental health, and gifted me a new pen-pal from New Zealand (@whoispriscilla). Priceless. The final day of the conference arrives and likely you’re tired, but buzzing from the swirl of inspiration and information. Like a worn hard drive, you’re nearing your limit on storage and maybe you’ve noticed it’s tough to read some of the notes you scribbled down the day before. Ride the inspo wave, but don’t let it fade, by revisiting goals set before attending the conference. Give yourself major credit for deploying that list and commit to a new set of items for when you’re back home, e.g. follow up with new contacts by x date, contribute to open source for accessibility. Acknowledge all the hard work that goes into running a smooth conference and take moments to thank people in person. Staff are generally easy to spot in uniform shirts and at registration desks. Share what the experience has meant to you (h/t Jennifer Tu @jtu who suggested this sprinkle of gratitude toward the end of her talk on empathy and team relationships). The moment I was granted the opportunity to attend RubyConf I was ecstatic…for about five seconds before the weight of impostor syndrome set in. This was THE conference to go to. Surely I’d stolen someone’s spot who deserved it more. I figured my story’s likely nothing compared to everyone else’s. New friends shut those ideas down real quick and were a great source of energy to learn from and recharge with. Find your people online and in person. Find excuses to reconnect. Uplift one another and nurture your own interests to debug any idea that you don’t belong. Huge shout out to RubyConf LA staff for providing 100 masks for its most vulnerable attendees and redirecting funds raised to provide relief for the unforeseen wildfires in California. RubyConf LA Committee, thank you for curating a fantastic lineup — especially the Ethical Track which included talks on AI and how reverse-engineering risks automating inequality. Thoroughly geeked. Group activities and front-row seating for scholars during keynotes made for an unmatched experience. For this and more, thank you @samphippen,@mghaught, @a_matsuda, @evanphx, @valeriecodes,@sarahmei,@erniemiller, @jameybash and @megantiu (who was also my kickass mentor and failed to mention President Barack Obama follows her on Twitter, nbd). You might be thinking “That sounds great and all, but I don’t have $400 sitting around for a conference ticket and hundreds more for travel and accommodation. Full and partial financial assistance is available for underrepresented groups who may not otherwise be able to attend. I applied for numerous conferences, heard back from five, and accepted half of the offers that fit with my schedule. Apply. Apply. Apply. Phew, so that’s my compilation of hacks that aren’t always explicit, but are hopefully worth knowing. Even if you do half of these things it’s okay to feel drained. Several days of introductions and back-to-back speakers can be overwhelming. Don’t. feel. bad. for skipping a beat. Again, most talks are posted online, so don’t hesitate to take time for yourself as needed. The pressure I put on myself to attend every talk initially has since dissolved. Larger conferences tend to be connected to a hotels so take advantage of the convenience and take a breather, but perhaps don’t get too comfy and oversleep. I encourage those who are even slightly curious about programming to step outside of their comfort zones and actively pursue opportunities for growth. If this has been helpful pass this along to anyone looking to get the most experience out of their next tech conference.